The 4th largest miniature park in Europe is located near the city center of Mariánské Lázně and has become the most visited attraction in the Karlovy Vary region! Miniature Park Boheminium was founded in 1999. Since then you can admire our incredibly detailed models of Czech tourist sights. We have great references of our visitors expreinces. Do not hesitate to come and make your own expreince with us. Admire the charm of Karlštejn Castle, the technical sights of Ještěd Tower or fabulous castles of Czech Republic in one place. Look forward to the beauty of the local landmarks. Our incredibly detailed models present more than seven dozens of perfect miniatures of significant monuments of the country. With its 115,000 visitors per year, it is no wonder, that our Park became the most visited attraction in the region. Hurry up to Miniature Park Boheminium Mariánské Lázně. Wonderful place for rest. One can "reset" it mind and switches to sweet memories. We've had a nice time here. The idea, concept and park environment is so unique. Only in the Miniature Park Boheminium you have the best chance to see the „best of“ tourist sights of Czech republic at one place - castles and chateaus, observe towers and other architectural gems. Karlštejn Castle, Ještěd Tower or the Colonnade of Mariánské Lázně – all in one place! Miniature Park Boheminium is a great place to learn more about the Czech republic landmarks and history for schools and kids of all ages. Where else can you see the details of the paintings, vaults, shutters or roofs of our most significant monuments from a few inches? Come and get some interesting facts about our beautiful country and make your own experience to share. Our Park has the great location. On the Krakonoš hill, surrounded by the woods and meadows is hidden fabulous place to rest. The unique atmosphere is completed by the nearby horse pastures. Enter the Park, relax and feel the calm energy. History is in the air inside the Park. Over 3 years Internet users are evaluating our Park on Google. Reviews from dozens of reviews are highly above average - 4.6 stars. Overall the Miniature Park Boheminium was rated by 120 users of the portal, resulting in a Certificate of Exceptionality and an overall rating of 4.5 out of 5 possible points. Over 1300 users of „Kudy z nudy“ portal rated our park. The result is 4.3 points from 5 points and top positions among the Czech attractions. The tourist community park is warmly recommended and we have the highest possible rating. Exhibition of selected models on Regiotour 2014, we have received many awards. Miniature Park Boheminium was awarded by an independent group of parents, who share their experiences in their reviews of places of interest suitable for families with kids. 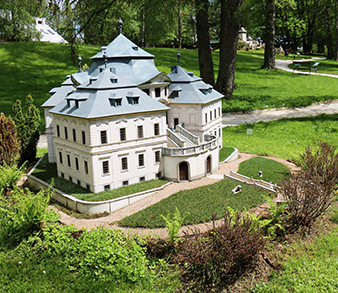 TripAdvisor rewarded Miniature Park Boheminium with a certificate of Excellence - Mariánské Lázně - in 2016. This certificate was gained by excellent reviews. We have the highest possible rating from users Catalogue of companies, on Seznam.cz website.